Successfully Added USB 7.1 Channel Sound Card to your Shopping Cart. Listen to your music like never before. The 7.1 channel sound card lets you be in total control of your audio needs. The magnitude of improvements and applications for using this USB 7.1 sound genius is limitless. The virtual speaker shifter can deliver up to 7.1 channel surround sounds over common stereo speakers or headphones. The 7.1 sound card is designed to transform all your digital stereo audio sources into 5.1 Dolby Digital (AC-3) and stream the sound to your external decoder or home theater systems via a single S/PDIF. You can even convert common stereo music to become 5.1ch digital surround sound. The virtual speaker shifter sound technology allows you to shift each virtual speaker or listener within the software to optimize the sound field. The virtual speaker shifter can deliver up to 7.1 channel surround sounds over your stereo speakers or headphones. With the CVKU-K43 DDLive sound card, you can play your PC games, DVD movies, and MP3 music with your Hi-Fi 5.1 Home Theater system. 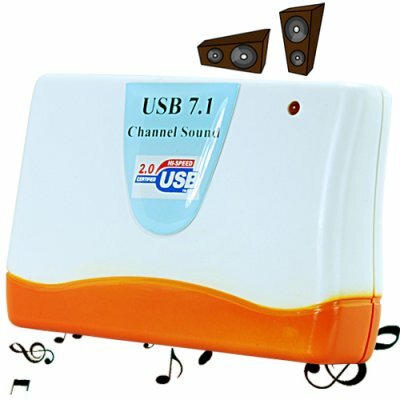 Designed to be used by the average consumers, simply connect the 7.1 channel sound card to any USB port on your desktop computer or laptop, install the included software provided, and then you are good to go! The 7.1 channel sound card provides 10-band Equalizer options letting you select different genre frequencies, and improve the output of the type of music you're listening to. Also coming with 12 pre-set modes and 27 simulated environments, you can achieve amazing sound effects from your music that standard stereo speakers simply can't touch. The MIC feature is another great addition to this 7.1 channel sound USB device. It allows for karaoke functionality, and overall improvement of audio recordings. Using the software provided, improve the sound of your voice by adjusting the key-shifting and voice cancellations and amaze your friends and family with your singing. This awesome 7.1 channel sound card is in stock today. Order yours at a factory direct wholesale price, from the leader in consumer wholesale electronics, Chinavasion. What is the sampling rate of digital recording function? After installing the USB 7.1 channel sound device, insert your 3.5 mm jack lead into the port that specifies "Front Out" on the USB device and insert the other end of the 3.5mm plug-in cable to your stereo. Can the software really manipulate my voice to sound different? Photos and Graphics By: R.W.